My friend’s basement flooded recently, and when he was hauling stuff out of there in order to keep it dry, he happened to find a box of old, strange childhood card games from when they were really popular and it seemed everything had a card game with it. We found a book of Zatch Bell! playing cards, an old anime about magical fighting puppers, a knock-off of Magic: the Gathering printed by a now-extinct card company, a game in the Yu-Gi-Oh! universe called Dungeon Dice Monsters, and several others in a sodden box, one of the others being the dreaded American Idol Season 3 Collectible Card Game. It sounds almost Lovecraftian when you think about it, doesn’t it? Like the Necronomicon, this terrible, terrible thing that seems fun, if perhaps dated, was found only in a flood. To my shame, I was one of the ones who lobbied to play it. In recent years, I’ve transitioned from becoming a casual, social gamer who only took part when there were other people there to someone who liked to try a taste of every game to see how it worked and how the mechanics reflected the theme of the game. Settlers of Catan, for example, is a pretty well-known strategy tabletop game à la the Civilization game series, where you preside over a relatively small kingdom and try to accumulate enough victory points to succeed, which while competitive, doesn’t really involve direct warfare (minus those terribly irritating well-placed Thieves to deny you your bricks for your Longest Road, of course). This is called a German-style board game; it focuses on tactical thinking rather than mere chance or conflict, keeps all players involved until the very end, and players interact only indirectly. Now take a more common card game, like War, an American-style game where it’s all chance, and an odd, bloodless form of fighting. I’ve seen people play it mindlessly for hours, not keeping track of who’s winning, but simply revealing and reshuffling in a sort of stupor (I do think it was finals week at my college when this happened, which I admit to their benefit). Even more complex games, such as Yu-Gi-Oh! or Magic: the Gathering, while having far higher levels of strategy, still operate with direct interaction and the paradigm of conflict. There are two decks, two people, and you have to cast spells or summon monsters to get their life points down to 0 as quick as possible. In the world of Yu-Gi-Oh!, this is taken further in “Shadow Games” where the opponent does actually die if they lose at their children’s card game, their soul consigned to a place of suffering and pain for all eternity. Which is really pretty dark for a child’s game, but that’s beside the point. To get the point, and the godless abomination that is the American Idol Season 3 Collectible Card Game, we can see there are indirect interactions and direct interactions, and that indirect interactions are generally on a higher level than direct ones. The American Idol Season 3 Collectible Card Game, referred to as the endless dark hunger between the stars AICCG from here on out (pronounced like the sound you make when you bang your shin on something at night) is primarily American-style, as you might guess. And American-style games are more about drama and conflict and big swings, and AICCG does indeed have these, but also has this fatal flaw: it’s never-ending, in a hideous, eternally frustrating cycle before you ever get to the end-game. Literally endless. But before I delve into its abysmal depths, let me tell you the story of how we first played it. Several months later, after it was pulled out of the grimy depths of the flooded basement and we’re checking out the repairs and renovations, complete with gray hardwood floors, rainbow LED lights, a mini-bar, the works, he pulls this innocuous blue box out of a drawer. “Hey,” he asks, grinning, “remember these?” And of course we didn’t, but looking through the cards, the names seemed fun enough, with songs like “Ruff Boi” and special cards like “Judge Nasty Says No,” and we decided to give it a whirl. The void of despair and judgment that is Judge Nasty. “Judge Nasty?” you might be wondering, which we wondered too, until we realized that “Judge Nasty” was Simon Cowell, who in a stroke of genius didn’t allow his likeness be used in the game. That was the first warning sign, really, but the game seemed simple enough. 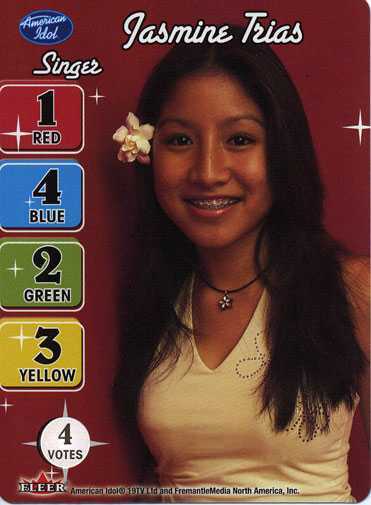 Play Singer cards, pair them with song cards, and when someone has three pairs you advance to the voting stage where players take turns voting points to themselves or others, dropping the player with the lowest points each time until one remains. This seems simple, initially, and the game’s instructions say it only takes fifteen minutes to an hour to play. What fools we were. In addition to the cards I just mentioned, there’s also judge cards that subtract or add to the value of the singer/song pairing. Say you play a singer worth 2 points, and a song worth 4, that’ll give you six points total. Then you can play a judge card on it to make it worth more, or you can play a judge card on others to make them worth less, and if the value goes below zero, it’s sent to the discard pile. Moreover, if there’s a pair of singer and song without any additions or other cards on it, there’s also the ability to “steal” songs by playing your own singer and stealing the unprotected song. At first, these seem reasonable, and while I’m slightly simplifying the game, it seems necessary for there to be some sort of player interaction to keep things interesting and dynamic rather than just a quiet matching game. But in reality, these do so much more. Even the kindest judge—Randy, who was still on the show then—has a high number of devastating -8 or -7 cards that can effectively destroy any pairing, and if one of those won’t do it, there are plenty of smaller ones for other players to pile on to destroy any hope of any single person getting three matches. And even when the cards, as is their nature, eventually run out, they reshuffle. So there are endless cycles of candids of now-defunct American Idol singers, dressed in familiar-yet-unfamiliar fashions, most of the female singers in inexplicably low-cut dresses and all of the guys for some reason wearing hats, endlessly cycling in and out of your hand and the field, and as you begin to taste victory while you have what you think are two indestructible pairings and a third on the way, like Briana Ramirez-Rial singing the infamous “Ruff Boi” song with her face caught in a strange, painful-looking grimace, the dream-crushing black silhouette of “Judge Nasty” and an inexplicably angry Randy Jackson thwart your hopes again and again, time after time. One of the damned who had their souls bound in the cards. The cycle continued between us five players for nearly two hours before I finally cheated and snuck a card under the table between my toes to keep someone’s third pair from being destroyed, but even that was only accomplished by me and another player actively playing “Yea, Yea, Yea!” and “Mhmmmmmmmmm” cards in their favor. And the thing is, we were stuck in this repetitive hell by playing the game properly, trying to keep other people from making matches and protecting our own, but the prevalence of the strong removal cards was so high it was impossible, making this truly the worst game I've ever played. Of course, it didn’t help that it was after midnight and we were all decently drunk, but at least for me it was frustratingly terrible I couldn’t help but laugh, and almost surreal, in a sense, playing endless hands of dead-to-the-world minor celebrities from a show I'd never even seen. Have you had any sort of terrible game like that? Let me know in the comments!